While rockets are fired by Gaza terrorists, PA farmers in the region are being taught by Israel how to export something better. While Hamas and allied terrorists continue to fire rockets and mortars at Jewish communities in the western Negev, Palestinian Authority Arab farmers in Gaza are being taught by Israelis how to export something better and more peaceful. Despite all provocation, Israel has continued “business as usual” and this month held its training programs in fresh produce export expertise to prepare Gaza farmers for the new season that starts in another week or two. Following the finalization of the trade process from Gaza to various European markets, a continuing education program for the region's Palestinian Authority agriculturalists was held last Tuesday at the offices of the Coordination and Liaison Administration for Gaza. 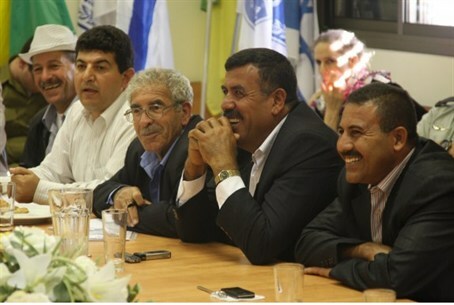 Representatives of the Coordinator of the Government Activities in the Territories (CoGAT) also announced that starting next month, a pilot program of furniture export from Gaza to Europe would also begin. “This conference is part of the ongoing daily cooperation between the Coordination and Liaison Administration for Gaza and the Palestinians in the agricultural sector,” said the IDF Spokesperson. During the past year, PA farmers in Gaza exported more than 399 tons of strawberries, 10 million carnations, 6.5 tons of cherry tomatoes and 6 million tons of red, green and yellow bell peppers to European markets. Quartet Adviser Tim Williams also attended the conference. One of the items on the agenda was teaching Gaza farmers to avoid the severe infestation of the red palm weevil, which destroyed crops last year. The pest managed to enter the region via the illegal tunnel network used by the Hamas terrorists to ferry people, weapons and contraband between Egypt and Gaza. “Though the existence of these illegal tunnels served as the catalyst for the infestation, the CLA assisted the farmers in Gaza whose crops had been damaged,” the IDF Spokesperson pointed out. “It is Hamas who is our mortal enemy, not the people of Gaza,” said Mark Regev, spokesman for Prime Minister Binyamin Netanyahu. “They have made it clear they consider every man, woman and child in Israel a legitimate target,” he told Arutz Sheva in a telephone interview Sunday afternoon. “The Hamas agenda is separate from the people of Gaza, who we consider to be victims as well,” Regev said.